Caroline Ingraham, UK. Opening Speaker. Early Bird Tickets out Now! Animal Healing with Tuning Forks - Sound Medicine of Our Future' Debbi Walker BSc Hons is the proud founder and director of Suara Sound Academy established in 2011 which delivers national and international Sound Healing Courses as an Independent Teaching School, registered and recognised by the British Complementary Medicine Association UK. All Debbi’s training courses are certified and insurable. Over the past 8 years Debbi has promoted her bespoke system far and wide of how to use the tuning forks of the OM (Sound of Creation), Weighted OM and 528hz (one of the Solfeggio healing codes for Miracles and Transformation and Universal Love). She has Ambassadors of Sound in America, Europe and the UK. Debbi has developed this bespoke method of using Tuning Forks for safe use, teaching this method of Tuning Fork Sound Therapy for Health, Well-being and Transformation of Mind, Body, Spirit and Soul. This may in turn potentially allow your 'reset' button to be switched on for optimum health and Wellbeing to be achieved and how that maybe for you and the animals you may treat in your care. Her teachings are based on her own research studies and comprehensive research in the field and intuitive practice. She is very into empowering other people to take their Health and Wellbeing back into their own hands, whilst working with their medical team as appropriate. This does not replace medical or vet intervention but will complement the Western Medical Approach. 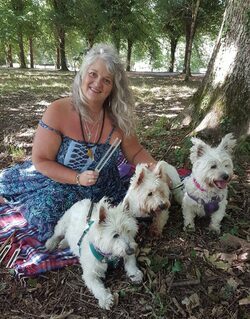 Debbi Walker lives in Cornwall, UK with her beloved husband Trev and equally beloved Westies, Maxie, Radley and Rosie. She has worked in Health and Healing for almost 30 years, and for 10 years was a district nurse in the National Health Service. Debbi has a first class honours degree in Tissue healing. She no longer works in this field, as in 2009 she became very poorly with ME/CFS and her contract with the NHS was terminated. Feeling alone and lost, bereft of her beloved nursing, she never felt so much the ‘Dark night of her Soul’. She was at breaking point, when she discovered vibrational energy healing in the form of EFT, Transformational healing and then Sound Therapy. She used this holistic approach to nourish her mind, body, spirit and Soul. Now she has no ME/CFS symptoms, enjoying the best health with fabulous energy, insights and spiritual guidance. She has a thirst for knowledge and enjoys all aspects of learning putting this to good use by creating her own research and studies into Energy Sound medicine. Debbi has a solid clinical background in Nursing and having attained the First Class Honours Degree in Tissue Viability she has a depth of understanding about clinical processes and just what stress and anxiety can do so the body to humans and animals alike. As a nurse (retired), she brings biological science and esoteric metaphysical aspects to her teachings allowing for balanced learning with evidence based practice. Tuning fork sound healing compliments all other modalities and reports are suggesting results are being achieved faster with clients as they are able to go into a 'deeper' meditative place. By using tuning forks you have a delivery system of a vibrational frequency that is able to target certain areas of your Physical, mental or emotional health and well being. Debbi and her Ambassadors of Sound have worked with many pets and animals such as dogs, cats, horses, tortoise’s, hamsters, birds, elephant to name a few that have enjoyed receiving the tuning fork sound therapy. It has helped with a range of conditions from skin conditions, anxiety, pain and discomfort, being lame, wound healing, trauma plus many more. One of the things Debbi is very keen on is allowing the onus to be on teaching the guardian of the animal to do it for their own animal and for themselves. This strengthens the bond and both parties are getting the sound healing. In some cases the pets will take on the guardians concerns on an energy level. The sound of the tuning forks using the Clear, Cleanse, Balance helps to readdress this balance. Princess Rosie, 10 year old Westie was rescued in 2017 by Debbi and her husband. Rosie was diagnosed with Kidney Failure and Dementia in August 2017. She enjoys her sound healing and the video shows Debbi using the weighted OM during her tuning fork course. It is now more than 1 year on and she is doing really well and receives her Sound Healing on a daily basis.